When creating a Report or a People View, there are a few options when it comes to specifying your filter criteria. One of them is called ‘Advanced: Create your own logic’. In the following screenshot you can see an example of Advanced Filter Logic. 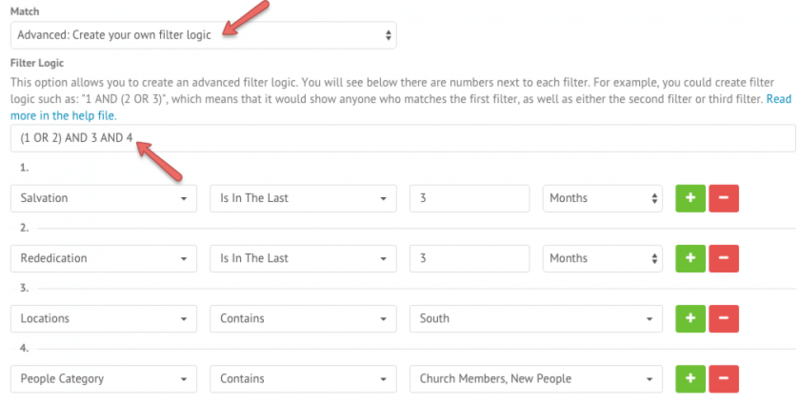 Next to each filter item at the bottom of the screenshot you’ll see numbers, so the above filter will look for the people who have either their salvation date, OR rededication date in the last 3 months, AND located at the south campus, and in the people categories Church Members or New People. You can put brackets around the different statements, to set the system to look at those fields first. At this stage only AND or OR statements are accepted, NOT, NOR, XOR and NAND statements are not accepted. Remember: ‘OR’ will show you both/all the criteria’s results (giving you more results), whereas ‘AND’ limits the results to people who fit both/all the criteria (giving you less results).